What Regards Us As We refuse To Regard In Turn? Previously: A nascent cover-up, the master map, and weird stuff getting curiouser and curiouser! 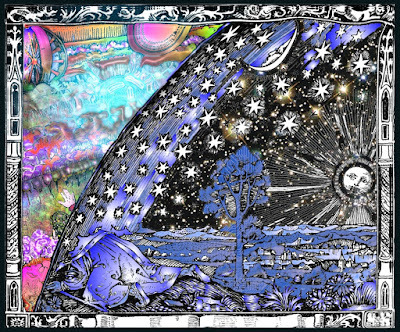 ...Through the Keyhoe, then, down a rabbit hole just getting more contrarily substantive, less dreamlike the further we fall... That is curious! We introduce another piece of the Flatwoods personage puzzle. This will be a brother writer/researcher in the tradition of the aforementioned men Gray Barker and Ivan T. Sanderson... those savvy investigators doing the best they could with what they had... but men still falling short of solving the Flatwoods enigma! Remember, these men all knew that there was "something" there, but they didn't have Feschino's future chronological advantage and his PBB File access! They didn't have their own shoulders on which to stand! So, now we encounter another in that line, Major Donald Keyhoe, USMC retired and military aide to that Charles Lindbergh. Too, we begin to throw more light on that irritating government predilection to the reflex cover-ups awarded to highly strange incidents. It's an affectation that our officiality always seems to have regarding these matters. Anyway, Keyhoe, quickly to become a nascent ufologist himself, is a hard-nosed rationalist and as equally hard-boiled as a writer, so a communicator. More to the point, he's hardwired with military contacts close to this "UFO problem." This is a man who might be an interesting source for info on same, n'est ce pas? The reader can be assured that here was a man of no small credibility. He was hugely respected by any and all. "First, the glowing object seen by Mrs. May and the boys was actually a meteor; it merely appeared to be landing when it disappeared over the hill." 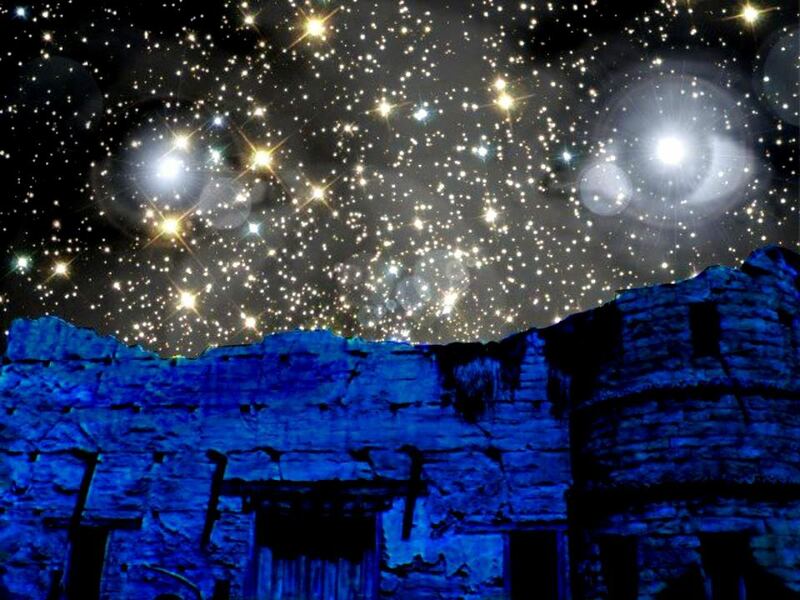 "Second, the group did see two glowing eyes, probably those of a large owl perched on a limb. Underbrush may have given the impression of a giant figure, and in their excitement they may have imagined the rest." "Third, the boys' illness was a physical effect brought on by their fright." "Fourth, the flattened grass and supposed tracks were caused by the first villagers when they came to investigate." How about, ...No? ...Just, no. With regards UFOs and their affiliation with a "humanity," it is a can just not kicked forever down the road without consequences coming due. One won't put off the dentist forever. Keyhoe would have known these same things, himself. First, a meteor of the size described would have certainly provided for "Flattened Woods" as Stanton Friedman pointed out, to start, and besides, there were no meteors, remotely on or in the record on those days, for the finish! Second, the "Owl" of the area was never misidentified before nor has it been misidentified since! It is ludicrous given these persons involved were not credulous hillbillies confused as regards their own local fauna, fauna known for generations. Moreover? The "owl" in question never was. It was an invention, you know, like Joe Nickell's ufological relevance. 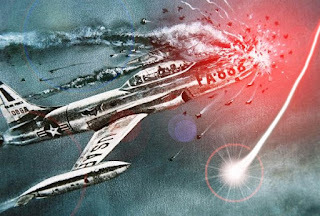 Fourth, the Air Force assertions are not supported by the facts, then or now. The biggest of their assertions, the "The meteor," falls apart at the beginning and all the rest degrades in light of the record extant from the time. Sorry, Doctor (immaterial) Joe Nickell. One won't carry much sand in a sieve. Ok reader, now let's make an overview of the scene at Flatwoods, its cast of characters, and then the perplexing activity of this inexplicable affair. This will be an "activity" decidedly odd even given circumstances later (and too readily this writer adds) dismissed by your garden variety, so suspiciously militant, naysayer (read skeptibunky)... as "hillbillies" reacting to their local "fauna." Not remotely true. Ludicrous on its face. 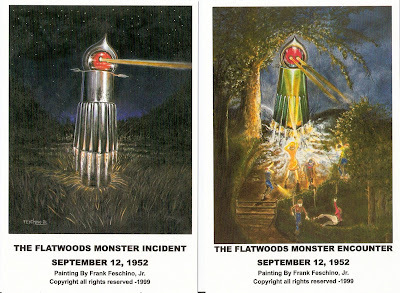 There were Project Blue Book intelligence officers and other officials involved in the "Flatwoods Monster" case, present. 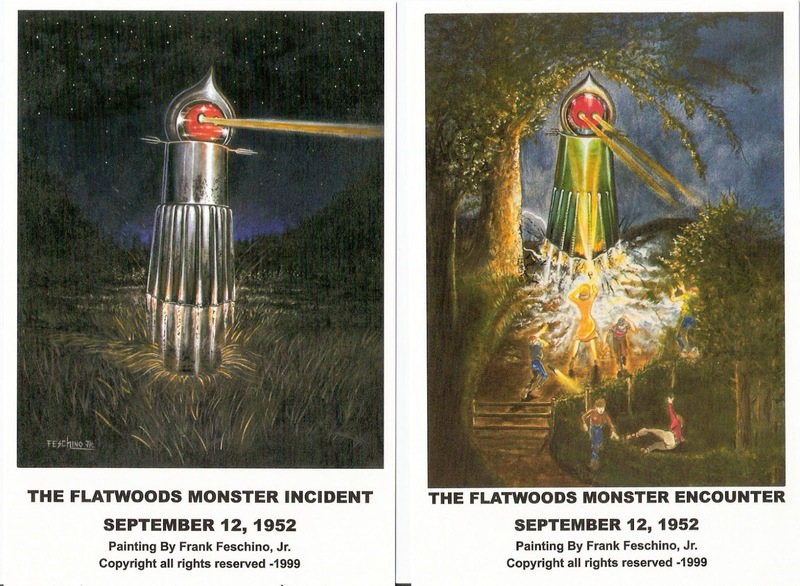 The first-hand telling of these investigative events, which occurred in Flatwoods, can be read in Feschino's book as they were told to him by the primary "Flatwoods Monster" witnesses. 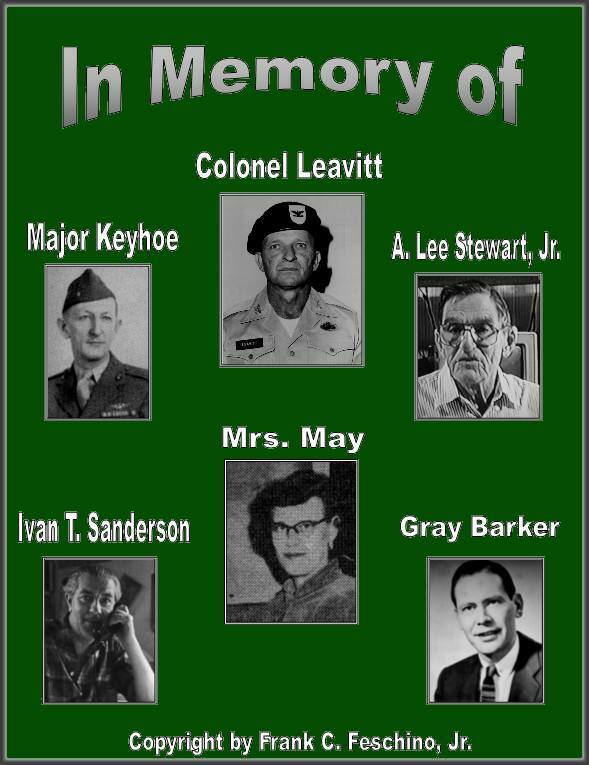 One of them, Mrs. Kathleen May, the woman who actually met and encountered the Monster and Project Blue Book officials at the scene, is, like her sons, a key first-hand witness never losing a shred of dignity and credibility over the decades. 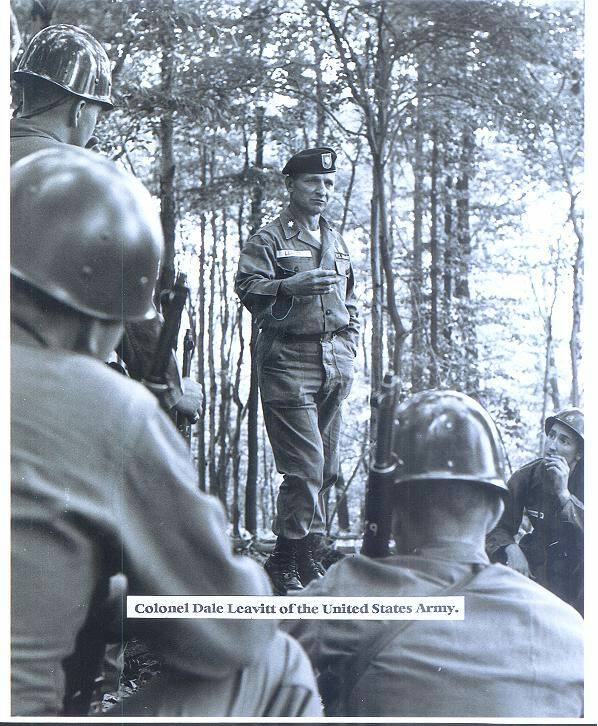 Enter, now, one Highly decorated WWII Vet Colonel Dale Leavitt, the commander of the West Virginia National Guard. He was the OIC of the military initiative into the area, provoked by nameless circumstances so busily severe that police could not respond to calls! Fact. 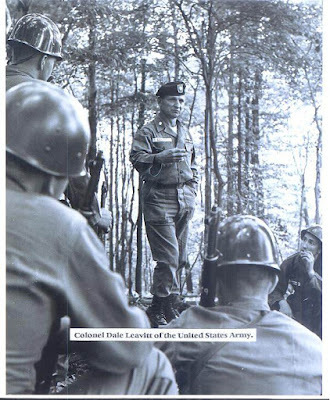 He personally led a heavy platoon of troops onto the Flatwoods encounter site after receiving an unusual and off-chain-of-command call from the USAF in Washington, D. C. to deploy to Flatwoods with haste! An apt response to "hillbilly kids" provoked by a simple meteor into seeing a space monster around Halloween this writer asks? This writer, in turn, suspects not. Oh, and the many others who told Feschino about the officials involved in the Flatwoods case. These would include A. Lee Stewart, Jr., the reporter who broke the story to the world, and then first-hand witness Neil Nunley, who also saw the "Monster" at close range and knows an owl from what comes to be described later as a mechanism! There were the boys and they would be, on some levels, scarred for life, periodically mocked and humiliated about the affair. There are other issues. Yes, Feschino's research and investigation into this incident is indeed the most informative on record, the longest and most factually dense in history! The book is worth the price of admission to a... forthcoming future of the future forthcoming. Sometimes it's just that easy if we let it... if we're strong enough! See... this writer thinks it's not all bad news, or why the cover-up? Seem's the rare cover-up serving anyone but the cover-upper. That's the history. No, this writer thinks at this point he can safely say: were it not for Feschino's extensive, dedicated, and decades-long investigation, his devoted research into the events of the September 12 and 13, 1952 vis a vis resurrected Project Blue Book case files... there would be no Flatwoods case, at all, today. It would have remained lost forever... buried, like our government plainly intended it to be. There would be no Flatwoods books, no Flatwoods TV shows, no Flatwoods radio programs, stories or Flatwoods... anything. 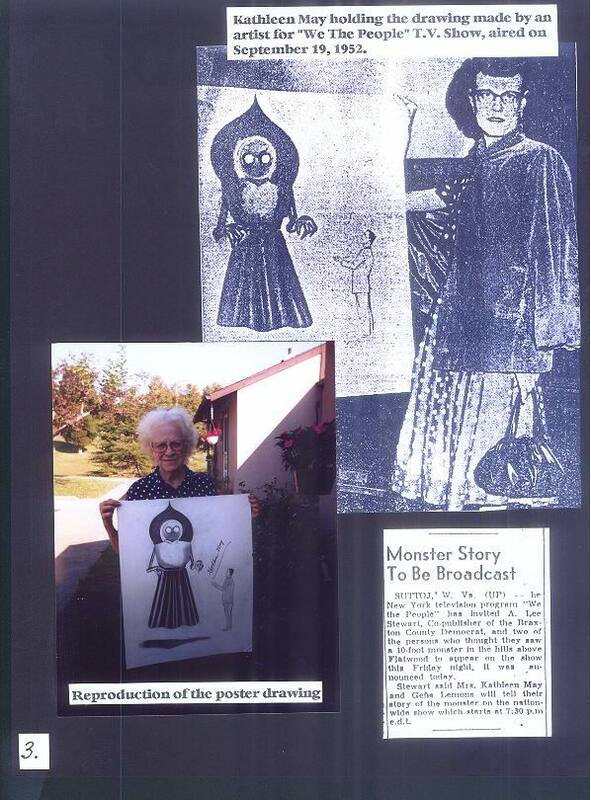 In other words, Feschino single-handedly uncovered and resuscitated knowledge of this massive UFO cover-up and, with the help of Stanton Friedman and a few others, arduously exposed the cover-up of the "Flatwoods Monster" incident, et al! There's more than mere punch in this pudding, reader. Countless others, on the other hand, have a similar intuition ... now, thanks to Feschino! The "Flatwoods Monster" or "Braxton County Monster" is Feschino's baby, cutting to the chase; it is his story, all the evidence comes as a result of his efforts pretty much alone, and he deserves his dominion over same. I can attest to this having worked with Feschino for many years, traveled with him, having done some radio programs with him... even appeared on a 2010 History Channel Flatwoods episode with him alluded to previously. Crom's devils, I wrote the back cover review of his ground-breaking book! This writer, summa graduate, and former Master Aviator is convinced some game was afoot! Recently, Feschino told me, "I don't mind, so much, the others who have latched onto the story or pretend to be experts." He said, "I know the facts of the case! I was the one who devoted nearly half of my life uncovering the incident! The rest are pretenders." He adds, "My books, radio interviews, and the video/audio documentation of witnesses in my documentaries are my testament and track record, and they go back to 1991." This could all very well be true. In fact, it occurs to this writer that Feschino may have been the only one to break this story! A tall claim, but as a school trained renderer across many artistic media disciplines, to even a forensic quality, Feschino was able to "draw out" what witnesses were describing in a way that jogged abused and shell-shocked memories of these affected persons and in a way your garden variety investigator cannot or would not. Thing is? I liked it, or would have. I rather liked the smoky innuendo, the humanist sub-plotting, the X-file-esque feel, the actors and the acting, or would have. This writer says that having had to pay to see it. I would have been glad to drub it were it execrable... but it was not. It was rather like a Twilight Zone episode encouraging the reader to think and wonder, mayhap... because it was allegedly based on fact... ...and there comes the rub! 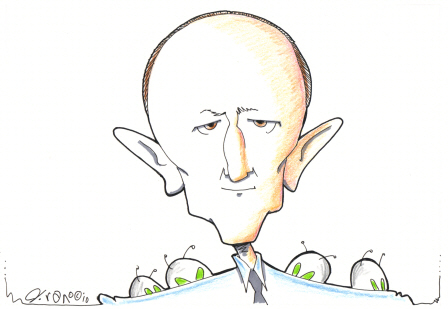 See... the real Flatwoods story comes at a time during the biggest UFO flap in US History. Fact. 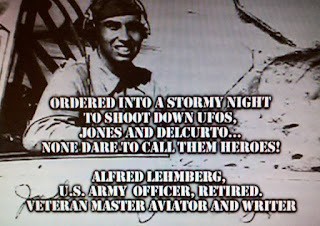 In 1952 UFOs were so ubiquitous, bothersome, and threatening to prohibited flight spaces that President Harry Truman ordered the military to shoot those UFOs down! Fact. 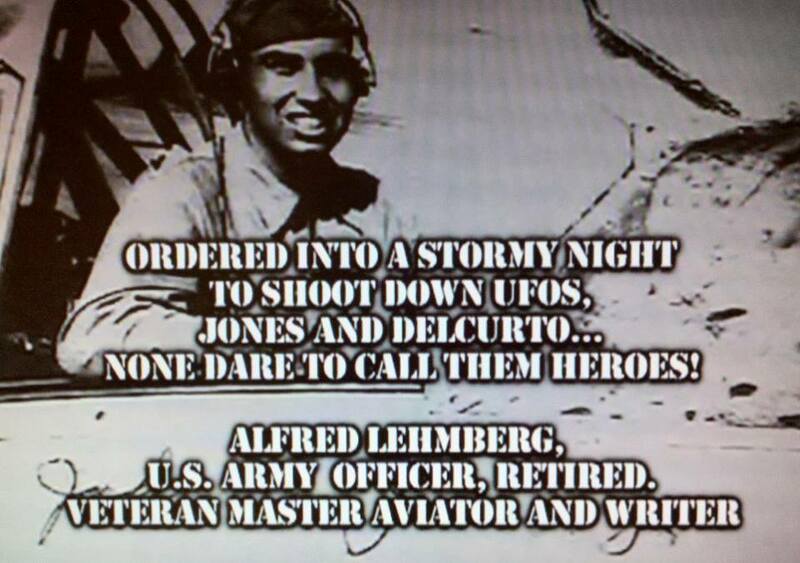 Men and machines are credited lost in this... air war. Fact. One of these UFOs, damaged in the conflict, finds its way to the center of West Virginia and crash-lands. Fact. 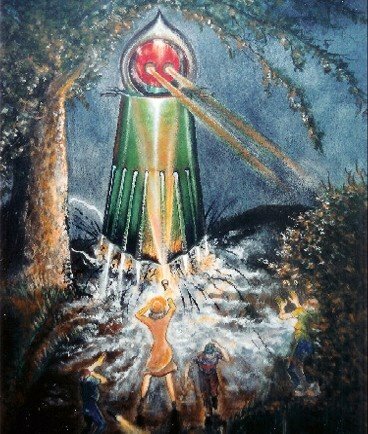 There is "contact" between frightened locals and the UFO's conjectured occupant. Fact. Seems like a hell of a story to me. ...And scene! Not so, History's Project Blue Book episode. "Based on fact" is not served by a content alleging to be factual while being in no way factual, beyond the bones of a shrouded statuary carved of a demeaned factuality, story distortions to the factual contrary ridiculously confabulatory... Truth disparaged to become a laughable distortion of facts reworked into a dismissive parody of what happened, actually, so as to perhaps dismiss, as parody, what actually happened! Was that it? As a pure fiction I would have liked it! I was adequately entertained. Yes, I would have liked it unreservedly, but there is that duplicity problem. It said, as much as more than intimated with a heavy hand, that it was based on a true story! The credible, then, wholly discredited. Readily believed rumors. Gladly ignored facts... When did we come to this? What's up with that? Remains, Truth, as it can be hashed out for our existential reality, is degraded and subverted by this program and programs like them. They made the true story ridiculous and so made it forgettable. That's unforgivable. ...Though, who would have thought that it would be the History Channel to obviate our real history, eh? This writer stifles a snort. Though, this is, and has been, the apparent case. ...Still, seems there may be a special place in History Channel hell for programs professing one thing, doing something altogether and solicitously different, and then mocking the very truth on which that truth was professed to have been based, as truth... just for the old injury accessorized with unearned insult one would suppose? Some good faith seems called for! The History Channel's betrayal is a disgusting kind of irony, this writer says true. I asked Feschino for his opinion of the alien "monster" as portrayed in the Project Blue Book, Flatwoods Monster episode. Feschino laughed. "To me, it looked like a 10-foot tall hot-dog somebody left on the grill too long. ...Ya know, that hot-dog nobody wanted getting pushed to the back, off the grate and forgotten about... Add a pair of piss-hole in the snow eyes and grabby-ghoul arms and you have one hell of a silly-looking portrayal of the 'Flatwoods Monster.'." "Mrs. May would have been devastated and disappointed if she had seen this episode... the way they handled it... the way they portrayed the attitude and demeanor of the principals and the townspeople, brave persons, actually, put under much duress during the affair. It was astonishingly, even libelously, inaccurate!" True enough, these people did not deserve this characterization. This writer has spent time with these people. He is wholly outraged for them. "You see, I worked with Mrs. May for many, many years, knew her well and spent countless hours talking with her and documenting her testimony. There was a reason that she worked with me for all of those years... it was because she trusted me and wanted the truth to come out... so did I! ...And that's what I did—I told the truth!" Closing, Feschino clued this writer to his outline for a plan well structured as a framework to, at last, get the... beyond astonishing... true story right, at last... dead pilots killed and missing in terrifying military action, their falsely dishonored memories, and the tortured souls of bereaved relations rather earn this clear-eyed consideration. "My definitive goal at this point," he says unblinkingly, "is a Hollywood movie based on my book. To that end I have already written a treatment for a screen play. It is a real blockbuster and will never be equaled. I can guarantee that... and this story really is based on the truth..." This writer's money is on Frank Feschino.